This is the last Will and Testament of me Mary Ann Miles Hunt of Marnhull in the county of Dorset Widow. that is a sixth part unto my daughter Amelia Adelaide Green of Crosses Farm Marnhull in the county of Dorset aforesaid. Another sixth part unto my son Frederick William Hunt of Yardgrove Farm Marhnhull aforesaid. 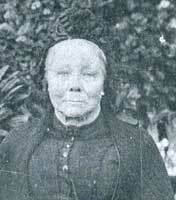 and the remaining sixth part unto my daughter Elizabeth Cree of New Park Farm Yarlington in the county of Somerset. And if any of the above named children shall hereafter die in my lifetime bearing issue any of whom shall be living at my death such issue shall take (equally among ? ? which their respective parents would have taken if living at my death I impower my trustees to apply any part or parts of the capital of the fund or share to which each or any infant beneficiary shall be entitled or contingently entitled under the trusts aforesaid in or towards the advancement in life or otherwise for the benefit of the same beneficiary. I declare that all my investments which may become necessary or expedient in carrying out trusts or purposes of my Will shall be made by my trustees in their names in or upon such securities as they shall think fit with power from time to time to vary the same and that they shall not be answerable for more money than shall actually come into their hands by virtue of this my Will. Signed M A Hunt June 25th 1901 In the presence of us in her presence and in the presence of each other have signed our names as witnesses. Footnote : Jesse Meader was married to Elizabeth Ann Collins, the daughter of Lavinia Hunt, Mary Ann's sister in law.